OK, this bit about having female companions fall for the Doctor really has to stop. 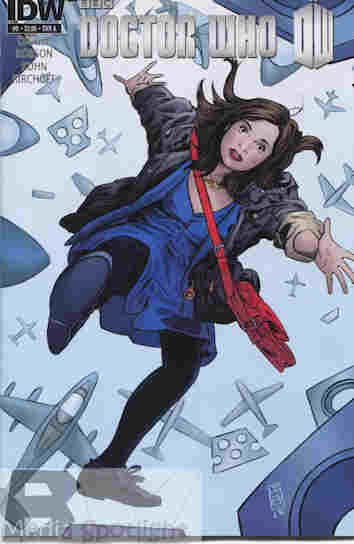 Clara makes her US comic debut after pressing a button in the TARDIS she was instructed not to press. Rescued by a plane carrying a third bomb heading for Japan during World War 2, she finds herself in an endless sky…and the Doctor with a beard. What they got right: While I miss Amy & Rory, I suppose it is right to have the current companion. The artwork is pretty good. What they got wrong: It’s tough to really judge anything because this whole issue is just one big set-up. I have seen this done before in a episode of the animated Star Trek, so we’ll have to see where it goes. Recommendation: As things stand, I can’t condone or condemn the comic. It’s all just set-up and will require at least the next issue if not all four parts of the arc to make a decision. I hate when comics do that. There isn’t even a decent Best Scene nomination. Posted by ShadowWing Tronix on May 27, 2013 in Television Spotlight, Today's Comic and tagged Andy Diggle, Eddie Robson, Eleventh Doctor, IDW Publishing, Mark Buckingham, TARDIS. The spambots are targeting this article, so I’m putting comments on hold for now.